Date: 3rd weekends, Friday, Saturday and Sunday of May. The official name is Asakusa Jinja Reitaisai. 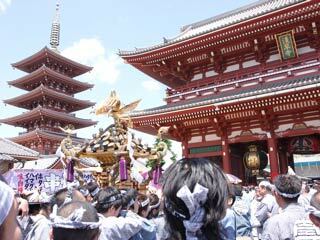 The original festival was started in1321 by the legendary story of Sensoji Temple. During the Edo Period, it was not festival with Mikoshi but all of the towns around Asakusa pulled parade floats, and only Miya Mikoshi was carried by the people. Current festival was held by 44 towns of Asakusa. On the second day of the festival, all towns start carrying Mikoshi travel to the Asakusa Shrine and Asakusa Town for all day long. On the last day, all town carry three Miya Mikoshi, the Mikoshi of the shrine, by relay style from one town to the other town. This is called "Mikoshi Kakucho Togo." Every year, about 1,450,000 people join Sanja Festival.